Games that kept iOS lovers thrilled throughout 2015, The Most Downloaded & The Most Played best iOS games 2015. Now, smartphone users simply have many games downloaded on their i-device. But, you should try the very best of iPhone/iPad gaming. Let’s make a summary of the games that impressed most iPhone users throughout the year 2015. 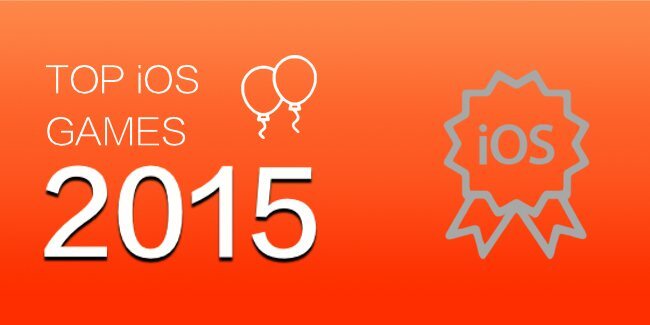 Here is the list of best iOS games 2015. 8/10Ok, how does this sound: above the placid ivory snow lies a sleepy mountain village, brimming with the promise of adventure? I know very dreamy, you may like to experience it yourself by joining Alto and his friends as they embark on an endless snowboarding odyssey. Journey across the beautiful alpine hills of their native wilderness, through neighbouring villages, ancient woodlands, and long-abandoned ruins. Discover six unique snowboarders, each with their special attributes and abilities. The best animation and graphics this game has to offer with mind-blowing sound effects. Download it now! 8/10This is the sequel to the original Angry Birds. Players have the freedom to create their unique strategies. Individual birds and spells are represented on cards. The game may be connected to Facebook to compete with the player’s friends in high scores. Nice graphics, special effects and overall the appeal of the game managed to be on the top inside & out of 2015. 8/10The ultimate battlefield to Crush your enemies using the iconic Warthog or sweep them off. Experience an all-new story that will take you on Earth to the enigmatic Gamma Halo located at the edge of charted space. Earn achievements, complete weekly challenges and take the top position against friends in Leaderboards that showcase your Halo gaming skills. 8/10This is the game for music lovers. It is music video game developed by FreeStyleGames and published by Activision. New GHTV progression system allows you to rank up and unlock additional upgrades. You may like to compete with other players. The exclusive feature it offers it the option to hook up your musical instruments to your iPad or iPhone, absolutely amazing. 8/10Spin webs of your own design and trap unwanted insects as you explore a mysterious abandoned mansion. Learn the truth about what happened there and leave the place covered in cobwebs. Clues, switches, hidden rooms, etc., are in every room. And it’s a blast to find them, especially when they involve new and unseen bugs. The killer soundtrack and the hand-drawn graphics will keep you captivated throughout the game. 8/10It is the turn-based puzzle video game in the Tomb Raider series. The game gets more complicated as the player progresses levels. Successive levels introduce new game mechanics and enemy types. Overall, the game has all the plans to keep you ringed with its jolts. Experience lush visuals and a captivating soundtrack. However, this game is not compatible with the iPhone 4. 8/10Shout for the Star wars lovers! Well, the name says it all, do I need to brag about how uplifting this game is for the star wars geeks? Obviously, it is an action role-playing game. Players have the option to create avatars and are able to purchase skills and upgrades. Call up your star war groupies and start the war! The rich dynamism of the visuals makes it worth playing. 8/10Hey racers! Check out our latest update, which includes: Visual Improvements, VIP Program & New Tournament Car. Highly recommended for the car & speed freaks. Need for Speed: No Limits has a heavy focus on street racing, vehicle customization, and avoiding the police. The player can participate in time-limited special events, where the player will be loaned a special car for use in the event. All cars in the game can be customized with wheels, body-kits, wide body kits, and paint jobs, in addition to performance upgrade. 8/10Minecraft: Story Mode is an ongoing episodic point-and-click graphic adventure video game based on the survival video game Minecraft. Minecraft: Story Mode is an ongoing episodic point-and-click graphic adventure video game based on the survival video game Minecraft. The Graphics are breathtaking, truly adventurous. The game is for action lovers that feature combat and other action sequences. You will drive the story through the decisions you make, which is very thought provoking. 8/10The sensations and tension is higher this time. This game has taken the iPhone games to a new level. Clash of Clans is a multiplayer online game in which players build a community, train troops, and attack other players to earn rewards to build defences that protect the player from other players’ attacks. It is free to download and play. However, some game items can be purchased with real money. A network connection is also required. 8/10Welcome to the ruthless world of Vikings, where freedom, power, fear and violence reign supreme. Some brave warriors will be led by you in the battle. Players will have the option to build lofty palaces & to grow valiant. The superb graphics, compelling story and dynamic battles will have you hooked from the moment you start playing. FREE TO PLAY, Stunning graphics & Multiple language options are best features of this game. Grab it today. 8/10WWE IMMORTALS is free to play, but it contains items that can be purchased for real money. It is a game for the WWE goofballs. This game is the ultimate fighting club that takes the athletes of the WWE, their gimmicks, and makes them Fantasy Heroes. It appears to be based on a canceled fighting game by THQ. Illustrates a high definition graphics on an iOS device with custom animations for every single WWE Superstar. The battle fields are rendered fully in 3D. Works best in iPod touch 5th generation; iPad 2, 3 and 4; iPad Air 1 and 2; iPad Mini 1, 2, and 3; iPhone 4, 4s, 5, 5c, 5s, 6, and 6 Plus. Requires iOS 5 and later. 8/10Another fighting game on the menu for the militants. Experience the most terrific & farthest instinctual fighting game. Captivating animation and visually groundbreaking fighting will explain why I used “terrific”. Players will have to prove their fighting skills. The game content is generally suitable for ages 17 and up as it comes with intense violence, blood, and gore. 8/10Tiffi and Mr. Toffee is welcoming you to their candy kingdom. You may compete with your friends to travel through magical lands of cookies and candies. Hundreds of sweet levels to conquer the special surprises. Very easy and fun to play. And graphics will just render sweet craving to play more! 8/10Now we all know that Fifa has always established itself as the stand in mania for football lovers all over the world regardless of age, gender, race or anything. And the FIFA 16 is the first in the FIFA series to include female players, with 12 women’s national teams. All the new features made it more lucrative and allowed players to develop footballers in the team of which they are managing without actually playing them. So, in succinct these were the hypes for iOS game lovers of 2015 according to my understanding. Feel free to share your comment and feedback here.